Soundabout is excited to announce its newly established Soundabout Music8London project, with a new online network for practitioners and a virtual training centre launched on 31st January 2019! 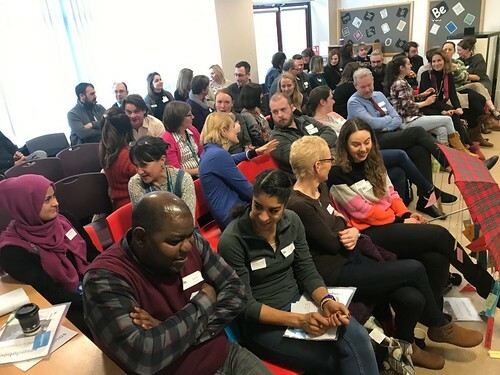 The Soundabout Music 8 London Network and Training Centre is a CPD training and networking initiative developed to provide opportunities for sharing good practice and enhancing skills in the field of music and special needs. Soundabout is creating a network of music practitioners working in special schools and hubs across the London Boroughs of Barnet, Brent, Camden, Enfield, Ealing, Haringey, Harrow and Hillingdon to form a network to share knowledge, learn from each other and roll out projects and training. 31st January saw the big launch event, held at The Village School, Brent. Forty-three delegates attended the launch and found the day ‘informative, full of new and exciting techniques and ideas to use in the classroom’. This CPD event will be followed further training provided by Soundabout – Follow this link to see the M8L-Training-timetable . Modules will cover areas such as Sounds of Intent, Soundabout tools and techniques, use of resonance boards, multi-sensory work and more. These training events will be held across schools in the area to facilitate school-based learning involving work with the children across the area. The project is being led by Jenny Cooper, who has been seconded to Soundabout for this project by The Village School, Brent, where she is Assistant Head (Expressive Arts lead) and Music Specialist. The Sisters of the Holy Cross Charitable Trust have part-funded this secondment and given it their full support, for which we are very grateful. It is intended that this project will reach and help to develop and support school teachers, learning support assistants, music practitioners and specialists as well as music hub staff in North London and surrounding Hubs. In so doing it aims to drive forward our aims of using music to unlock the potential of children and young people with profound and multiple learning disabilities and complex needs. We are keen to hear from professionals within the Music8London area to register your interest in joining the network. Surrounding hubs and schools outside of the Music 8 London network are also invited to make contact to register interest in becoming a Soundabout Music8 London Associate. All contacts can be made through Jenny Cooper at jennycooper@soundabout.org.uk.